Full integration with your existing website. High-End Client Interface in the exact looks and style of your main website. Charging first night, a percentage, fix amount or full amount as prepayment options. 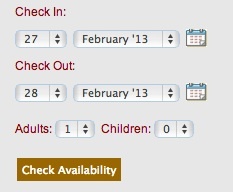 Multi room bookings, multiple check-in / check-out per single booking instance. Automatic display of booking alternatives. Custom prices for custom period. Last Minute Rooms & Packages Promotion.